Cottleville MO real estate has an average home age of 12 years. Homes for sale in Cottleville MO range in price from $125,000 to $475,000. The median home price in 2014 was approximately $275,000. Cottleville is one of the oldest towns in St. Charles County and has successfully preserved its historic charm. The main street is dotted with specialty stores and unique dining experiences. If you are looking for a small town feel in the heart of St. Charles county this is your town! Cottleville properties are served by both the Francis Howell School District and the Fort Zumwalt West School District School District. See Great Schools for up to date ranking on every school in the area. If you are looking for a home for sale in Cottleville MO or you would be interested in buying a home in Cottleville, please contact St. Charles real estate expert, Sharon Colona and St. Louis Realty for a professional and simple buying or selling process. Call (636) 397-7653 or email at scolona@stlouisrealty.net. Introducing the Woods at Cottleville Trail, an intimate enclave of 14 exclusive, 1 AC home-sites that back to mature trees & beautiful wooded areas. This one of a kind neighborhood offers Executive homes with exquisite features, dynamic Kitchens, spectacular Owners retreats and prof assistance from The Home Center Design consultants. Choose from ranch, 1.5 story and 2 story designs from the prestigious Estate Collection ranging from 2,220 - 3,840 sq ft. The Westbrooke is a spectacular 4 BD, 3.5 BA, 4,109 sq ft 1.5 story with a main floor MASTER BEDROOM SUITE, walk in closets in every bdr, a huge Bonus Room, Loft, a large Breakfast-Hearth Room and more. This highly desirable neighborhood has easy access to Hwy 364 and is conveniently located near the restaurants, shops, recreation & services in Cottleville and O x2019;Fallon. Students will attend sought after Fort Zumwalt schools. Enjoy running, walking & biking on the Great Rivers Greenway that borders this impressive community. Introducing the Woods at Cottleville Trail, an intimate enclave of 14 exclusive, 1 AC home-sites that back to mature trees & beautiful wooded areas. This one of a kind neighborhood offers Executive homes w/exquisite features, dynamic Kitchens, spectacular Owners retreats & prof assistance from The Home Center Design consultants. Choose from ranch, 1.5 story & 2 story designs from the prestigious Estate Collection ranging from 2,220 - 3,840 sq ft. The Parkview II is a popular, 4 BD, 3.5 BA, 3,840 sq ft, 1.5 story with a MAIN FLOOR MASTER SUITE. Features inc a gourmet Kitchen w/island, dbl oven, Lux Mstr Suite, W/I closets in every bdr & a large Bonus Rm. This highly desirable neighborhood has easy access to Hwy 364 and is conveniently located near the restaurants, shops & recreation in Cottleville & O x2019;Fallon. Students will attend sought after Fort Zumwalt schools. Enjoy running, walking & biking on the Great Rivers Greenway that borders this impressive community. Introducing the Woods at Cottleville Trail, an intimate enclave of 14 exclusive, 1 AC home-sites that back to mature trees & beautiful wooded areas. This one of a kind neighborhood offers Executive homes with exquisite features, dynamic Kitchens, spectacular Owners retreats and professional assistance from The Home Center Design consultants. Choose from ranch, 1.5 story and 2 story designs from the prestigious Estate Collection ranging from 2,220 - 3,840 sq ft. The Nantucket is a 3 BD, 2.5 BA, 3,292 sq ft ranch with a Hearth Room, a large Great Room, formal Dining Room and a luxurious Master Suite. This highly desirable neighborhood has easy access to Hwy 364 and is conveniently located near the restaurants, shops, recreation & services in Cottleville and O x2019;Fallon. Students will attend sought after Fort Zumwalt schools. Enjoy running, walking & biking on the Great Rivers Greenway that runs along the entrance of this impressive community. Introducing the Woods at Cottleville Trail, an intimate enclave of 14 exclusive, 1 AC home-sites that back to mature trees & beautiful wooded areas. This one of a kind neighborhood offers Executive homes with exquisite features, dynamic Kitchens, spectacular Owners retreats & prof assistance from The Home Center Design consultants. Choose from ranch, 1.5 story & 2 story designs from the prestigious Estate Collection ranging from 2,220 - 3,840 s/f. The Wyndham is a stunning, 4 BD, 3.5 BA, 3,752 s/f, 1.5 story w/a main floor Mstr Suite. Features inc a huge Breakfast room, dbl oven, center Kitchen island, W/I pantry, Luxury Mstr Bath & large W/I closets in every bdr. This highly desirable neighborhood has easy access to Hwy 364 and is conveniently located near the restaurants, shops, recreation & services in Cottleville & O x2019;Fallon. Students will attend sought after Fort Zumwalt schools. Enjoy running, walking & biking on the Great Rivers Greenway that borders this impressive community. Introducing the Woods at Cottleville Trail, an intimate enclave of 14 exclusive, 1 AC home-sites that back to mature trees & beautiful wooded areas. This one of a kind neighborhood offers Executive homes with exquisite features, dynamic Kitchens, spectacular Owners retreats & prof assistance from The Home Center Design consultants. Choose from ranch, 1.5 story & 2 story designs from the prestigious Estate Collection ranging from 2,220 - 3,840 sq ft. The Waterford is a stunning, 4 BD, 2.5, BA, 3,612 sq ft two story. Features inc a Great Rm window wall, Kitchen w/center island, dbl oven, huge W/I pantry, Luxurious Owners Suite & W/I closets in every bdr. This highly desirable neighborhood has easy access to Hwy 364 and is conveniently located near the restaurants, shops, recreation & services in Cottleville and O x2019;Fallon. Students will attend sought after Fort Zumwalt schools. Enjoy running, walking & biking on the Great Rivers Greenway that borders this impressive community. Introducing the Woods at Cottleville Trail, an intimate enclave of 14 exclusive, 1 AC home-sites that back to mature trees & beautiful wooded areas. This one of a kind neighborhood offers Executive homes with exquisite features, dynamic Kitchens, spectacular Owners retreats & prof assistance from The Home Center Design consultants. Choose from ranch, 1.5 story & 2 story designs from the prestigious Estate Collection ranging from 2,220 - 3,840 sq ft. The Nantucket II is a spectacular, 3 BD, 2 BA, 2,797 sq ft ranch. Features inc a large Great Rm, Gourmet Kitchen, dbl oven, Frml DR, Luxurious Owners Retreat & a Hearth Rm off the Kitchen & Brkfst Rm. This highly desirable neighborhood has easy access to Hwy 364 and is conveniently located near the restaurants, shops, recreation & services in Cottleville & O x2019;Fallon. Students will attend sought after Fort Zumwalt schools. Enjoy running, walking & biking on the Great Rivers Greenway that runs along the entrance of this impressive community. Introducing the Woods at Cottleville Trail, an intimate enclave of 14 exclusive, 1 AC home-sites that back to mature trees & beautiful wooded areas. This one of a kind neighborhood offers Executive homes with exquisite features, dynamic Kitchens, spectacular Owners retreats & prof assistance from The Home Center Design consultants. Choose from ranch, 1.5 story & 2 story designs from the prestigious Estate Collection ranging from 2,220 - 3,840 sq ft. The top selling Arlington II is a spacious, open 2,653 sq ft, 3 BD, 2 BA ranch with a Great Room window wall, a gas fireplace, a dynamic Kitchen with center island and a luxurious Owners retreat. This highly desirable neighborhood has easy access to Hwy 364 and is conveniently located near the restaurants, shops, recreation & services in Cottleville and O x2019;Fallon. Students will attend sought after Fort Zumwalt schools. Enjoy running, walking & biking on the Great Rivers Greenway that runs along the entrance of this impressive community. Introducing the Woods at Cottleville Trail, an intimate enclave of 14 exclusive, 1 AC home-sites that back to mature trees & beautiful wooded areas. This one of a kind neighborhood offers Executive homes with exquisite features, dynamic Kitchens, spectacular Owners retreats and prof assistance from The Home Center Design consultants. Choose from ranch, 1.5 story and 2 story designs from the prestigious Estate Collection ranging from 2,220 - 3,840 sq ft. The Woodside is a 3 BD, 2 BA, 2,662 sq ft, split bedroom ranch. Features include a Study-Flex Room, Formal Dining Room, Bonus Room-Optional Bdr 4 and center Kitchen open to the Breakfast Room and Great Room. This highly desirable neighborhood has easy access to Hwy 364 and is conveniently located near the restaurants, shops, recreation & services in Cottleville and O x2019;Fallon. Students will attend sought after Fort Zumwalt schools. Enjoy running, walking & biking on the Great Rivers Greenway that borders this impressive community. Introducing the Woods at Cottleville Trail, an intimate enclave of 14 exclusive, 1 AC home-sites that back to mature trees & beautiful wooded areas. This one of a kind neighborhood offers Executive homes with exquisite features, dynamic Kitchens, spectacular Owners retreats & prof assistance from The Home Center Design consultants. Choose from ranch, 1.5 story & 2 story designs from the prestigious Estate Collection ranging from 2,220 - 3,840 sq ft. The Durham II is a popular, open and well designed, 2,220 sq ft, 3 BD, 2 BA ranch w/a spacious Kitchen & center island, W/I pantry, Grt Rm window wall, Frml DR, elegant Mstr Suite & Luxury Mstr Bath. This highly desirable neighborhood has easy access to Hwy 364 and is conveniently located near the restaurants, shops, recreation & services in Cottleville and O x2019;Fallon. Students will attend sought after Fort Zumwalt schools. Enjoy running, walking & biking on the Great Rivers Greenway that runs along the entrance of this impressive community. No need to build when you can have this stunning 1 yr old dream home with all the Bells and Whistles! Over 3000 SF of upgrades & unique features. Open concept great room & dream kitchen, with 9 ft ceilings. Kitchen has lg island, 42 inch cabinets, solid surface granite counter tops, SS appl, recessed lighting, pantry & built in desk/work station nook. 3 car gar enters to mudrm with built in bench and storage, so cute! The dining rm with coffered ceilings is set off just enough for that special occasion. Main fl office with French doors is perfect for work that needs quiet concentration. Upstairs discover the refreshing individuality of your home. The MBR has king size comfort with a private sitting rm, luxury bath with dbl sink & a closet to wow! The lg loft is your families private gathering spot. 2 more bdrms, full bath & laundry upstairs. Custom window treatments throughout are lovely! LL is waiting for your families touch. Easy access to hwys & everything Cottleville has to offer. Payne Family Homes proudly presents Ashford Knoll, an exciting new homes community in an exceptional Cottleville location! Payne Family Homes is offering the Lifestyle l and ll Series of homes in this intimate, single entrance community of only 76 homesites. Choose from ranch, 1.5 and 2 story designs. The Montego II is a 4 BD (plus a loft), 2.5 BA, 1.5 story with 3,090 sq ft. Standards inc 3 CAR tandem GARAGE, 9 ft ceilings, 36 inch cabinets, Kitchen island, walk in pantry, Frigidaire appl, MAIN FLOOR MSTR BDR, dbl bowl sink in the Mstr Bath, 6 ft marble shower with seat, HUGE Mstr closet, W/I closets in every bdr, Jeld-Wen Low E windows, 50 gal water htr, full yard sod and prof landscape. Enjoy the quaint, intimate setting of nearby shops and restaurants in Cottleville or the many services and recreation on Hwy K in O x2019;Fallon. There is easy access to Hwys 364 and 40/61. Fantastic location, desirable schools and beautiful floor plans capturing the distinctive Payne Family Homes style! Payne Family Homes proudly presents Ashford Knoll, an exciting new homes community in an exceptional Cottleville location! Payne Family Homes is offering the Lifestyle l and ll Series of homes in this intimate, single entrance community of only 76 homesites. Choose from ranch, 1.5 and 2 story plans. The Breckenridge II is a 4 BD (plus loft), 2.5 BA, 2 story with 3,388 s/f of living space. Standards inc a 3 CAR GARAGE (4 car option), 9 ft ceilings, large Great Rm, Flex Rm, Den, 36 inch cabinets, angled island, Frml Dining Rm, dbl bowl vanity in the Mstr Bath, 6 ft marble shower with seat, W/I closets in every bdr, 2nd flr laundry, 50 gal water htr, full yard sod yard, prof landscaping and more. Enjoy the quaint, intimate setting of nearby shops and restaurants in Cottleville or the many services and recreation on Hwy K in O x2019;Fallon. There is easy access to Hwys 364 and 40/61. Fantastic location, desirable schools and beautiful flr plans capturing the distinctive Payne Family Homes style! Payne Family Homes proudly presents Ashford Knoll, an exciting new homes community in an exceptional Cottleville location! Payne Family Homes is offering the Lifestyle l and ll Series of homes in this intimate, single entrance community of only 76 homesites. Choose from ranch, 1.5 and 2 story designs. The Breckenridge is a 4 BD (plus a loft), 2.5 BA, 2 story with 3,186 sq ft. Standards inc 9 ft ceilings, 36 inch cabinets, island, Frigidaire appl, frml Dining Rm, Flex Rm, dbl bowl sink in the Mstr Bath with a 6 ft shower with seat, HUGE Mstr closet, walk in closets in every bdr, 2nd flr laundry, 50 gal water htr, Jeld-wen low E windows, full yard sod, prof landscape and architectural shingles. Enjoy the quaint setting of nearby shops and restaurants in Cottleville or the many services and recreation on Hwy K in O x2019;Fallon. There is easy access to Hwys 364 and 40/61. Fantastic location, desirable schools and beautiful floor plans capturing the distinctive Payne Family Homes style! Payne Family Homes proudly presents Ashford Knoll, an exciting new homes community in an exceptional Cottleville location! Payne Family Homes is offering the Lifestyle l and ll Series of homes in this intimate, single entrance community of only 76 homesites. Choose from smart ranch, 1.5 and 2 story designs. The Bristol II is a 4 bdr (plus loft), 2.5 bath, two story with 3,243 sq ft. Standards inc 3 CAR GARAGE (4 car option), 9 ft main flr ceilings, Grt Rm, Flex Rm, Den with dbl door entry, 36 inch Kitchen cabinets, center island, formal Dining Rm, double bowl vanity in the Mstr Bath, 6 foot marble shower with seat, walk in closets, 50 gal water htr, full yard sod, prof landscaping and more. Enjoy the quaint, intimate setting of nearby shops and restaurants in Cottleville or the many services and recreation on Hwy K in O x2019;Fallon. There is easy access to Hwys 364 and 40/61. Fantastic location, desirable schools and beautiful floor plans capturing the distinctive Payne Family Homes style! Payne Family Homes proudly presents Ashford Knoll, an exciting new homes community in an exceptional Cottleville location! Payne Family Homes is offering the Lifestyle l and ll Series of homes in this intimate, single entrance community of only 76 homesites. Choose from innovative ranch, 1.5 and 2 story designs. The Meridian II is a 4 BD, 2 BA ranch with 2,672 sq ft. Features inc 9 ft ceilings, Flex Rm, dynamic Kitchen open to the Great Rm, large island, 36 inch cabinets, Frigidaire appl, Jeld-wen Low E windows, main flr laundry, Dining Rm, walk in closet in Mstr, dbl bowl vanity, 6 ft marble shower with seat, popular side staircase, 50 gal water htr, full yard sod, prof landscape and more. Enjoy the quaint, intimate setting of nearby shops and restaurants in Cottleville or the many services and recreation on Hwy K in O x2019;Fallon. There is easy access to Hwys 364 and 40/61. Fantastic location, desirable schools and beautiful floor plans capturing the distinctive Payne Family Homes style! Family and Formal dining rooms, study, upper level family room with 9' ceilings on main floor and an open spindled, stained staircase are just a few of the wonderful features in this home. Lovely gas fireplace with marble surround in the great room, double doors lead you to the luxury master bath with garden tub, walk in shower, double bowl adult height vanities to name a few. Large kitchen window, 42' cabinetry, SS upgraded appliances, granite island, large pantry, recessed lighting and beautiful wood floors. You'll love the large main floor laundry, LL plumbing rough in, HVAC w/ zoned damper, 13 SEER AC, natural gas heat , double pane and insulated vinyl windows with painted wood sills. Professionally sodded yard and landscape package. 8' garage doors, enclosed soffit/fascia, overhang gable ends, weatherproof exterior outlets and faucets, PestSheild Pest Control System. Pictures may vary from actual home under construction due to be completed in MAY. Payne Family Homes proudly presents Ashford Knoll, an exciting new homes community in an exceptional Cottleville location! Payne Family Homes is offering the Lifestyle l and ll Series of homes in this intimate, single entrance community of only 76 homesites. Choose from ranch, 1.5 and 2 story designs. The Montego is a 4 BD (plus a loft),2.5 BA, 1.5 story with 2,691 sq ft of living space. Features include 9 ft ceilings, a Frml Dining Rm, open Kitchen-Caf xE9;-Great Rm, 36 inch Kitchen cabinets, walk in pantry, MAIN FLOOR MASTER SUITE, walk in closets in every bdr, a large Loft, Jeld-Wen Low E windows, Frigidaire appliances, full yard sod, professional landscaping, architectural shingles and more. Enjoy the quaint, intimate setting of nearby shops and restaurants in Cottleville or the many services and recreation on Hwy K in O x2019;Fallon. There is easy access to Hwys 364 and 40/61. Fantastic location, desirable schools and beautiful floor plans capturing the distinctive Payne Family Homes style! Payne Family Homes proudly presents Ashford Knoll, an exciting new homes community in an exceptional Cottleville location! Payne Family Homes is offering the Lifestyle l and ll Series of homes in this intimate, single entrance community of only 76 homesites. Choose from innovative ranch, 1.5 and 2 story designs. The top selling Meridian II is a 3 BD, 2 BA ranch with 2,501 sq ft. Standards inc a 3 CAR tandem GARAGE, 9 ft ceilings, large kitchen island, 36 inch kitchen cabinets, Frigidaire appliances, Jeld-wen Low E windows, main floor laundry, Dining Room, Flex Room, large walk in closet in Master Bdr, dbl bowl vanity, 6 ft marble shower with seat, 50 gal water htr, full yard sod and more. Enjoy the quaint, intimate setting of nearby shops and restaurants in Cottleville or the many services and recreation on Hwy K in O x2019;Fallon. There is easy access to Hwys 364 and 40/61. Fantastic location, desirable schools and beautiful floor plans capturing the distinctive Payne Family Homes style! Payne Family Homes proudly presents Ashford Knoll, an exciting new homes community in an exceptional Cottleville location! Payne Family Homes is offering the Lifestyle l and ll Series of homes in this intimate, single entrance community of only 76 homesites. Choose from innovative ranch, 1.5 and 2 story plans. The Ashton II is a 3 BD, 2.5 BA, open ranch with 2,161 sq ft and a 3 car tandem garage. Features inc 9 ft ceilings, open Kit-Caf xE9;-Great Rm, island, 36 inch cabinets, W/I pantry, Frigidaire appl, Flex Rm, Jeld-wen Low E windows, main flr laundry, HUGE W/I closet in Mstr Bdr, double bowl vanity, 6 ft shower with seat, 50 gal water htr, full yard sod, architectural shingles and more. Enjoy the quaint, intimate setting of nearby shops and restaurants in Cottleville or the many services and recreation on Hwy K in O x2019;Fallon. There is easy access to Hwys 364 and 40/61. Fantastic location, desirable schools and beautiful floor plans capturing the distinctive Payne Family Homes style! Payne Family Homes proudly presents Ashford Knoll, an exciting new homes community in an exceptional Cottleville location! Payne Family Homes is offering the Lifestyle l and ll Series of homes in this intimate, single entrance community of only 76 homesites. Choose from ranch, 1.5 and 2 story designs. The Bristol is a 4 BD (plus a loft), 2.5 BA, 2 story with 2,754 sq ft. Standards inc 9 foot ceilings, 36 inch cabinets, Kit island, Frigidaire appl, smooth top range, formal Dining Rm, Flex Rm, double bowl sink in the Mstr Bath, 6 ft marble shower with seat, large Mstr closet, 2nd flr laundry, 50 gal water htr, Jeld-Wen Low E windows, full yard sod, prof landscaping and architectural shingles. Enjoy the quaint, intimate setting of nearby shops and restaurants in Cottleville or the many services and recreation on Hwy K in O x2019;Fallon. There is easy access to Hwys 364 and 40/61. Fantastic location, desirable schools and beautiful floor plans capturing the distinctive Payne Family Homes style! Payne Family Homes proudly presents Ashford Knoll, an exciting new homes community in an exceptional Cottleville location! Payne Family Homes is offering the Lifestyle l and ll Series of homes in this intimate, single entrance community of only 76 homesites. Choose from smart ranch, 1.5 and 2 story designs. 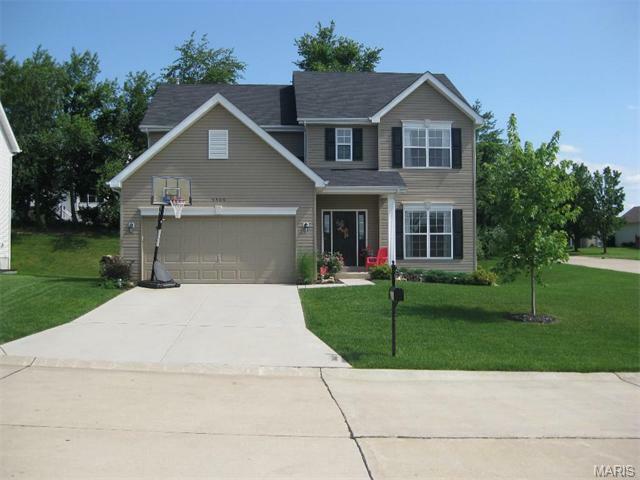 The Denmark 1.5 is a 4 BD, 3 BA, 1.5 story with 2,283 square feet. This open and inviting floor plan features a MAIN FLOOR MASTER SUITE, 9 x2019;ceilings, spacious Great Room, 36 x201D; Kitchen cabinets, center island, double bowl vanity in the Master Bath, 6 ft marble shower with seat, walk in closets, main floor laundry room, 50 gallon water heater, full yard sod, prof landscaping and more. Enjoy the quaint, intimate setting of nearby shops and restaurants in Cottleville or the many services and recreation on Hwy K in O x2019;Fallon. There is easy access to Highways 364 and 40/61. Fantastic location, desirable schools and beautiful floor plans capturing the distinctive Payne Family Homes style! Payne Family Homes proudly presents Ashford Knoll, an exciting new homes community in an exceptional Cottleville location! Payne Family Homes is offering the Lifestyle l and ll Series of homes in this intimate, single entrance community of only 76 homesites. Choose from innovative ranch, 1.5 and 2 story designs. The top selling Meridian is a 3 BD, 2 BA ranch with 2,339 sq ft of living space. Features inc 9 ft ceilings, a WOW Kitchen with a large center island, 36 inch cabinets, Frigidaire appl, Jeld Wen Low E windows, main flr laundry, Dining Rm, Flex Rm, walk in closet in Master Bdr, dbl bowl vanity, 6 ft marble shower with seat, 50 gal water htr, full yard sod and architectural shingles. Enjoy the quaint, intimate setting of nearby shops and restaurants in Cottleville or the many services and recreation on Hwy K in O x2019;Fallon. There is easy access to Hwys 364 and 40/61. Fantastic location, desirable schools and beautiful floor plans capturing the distinctive Payne Family Homes style! ONLY 2 HOME SITES LEFT! This TBB Canterbury is the top of the line ranch style plan from Rolwes Company, located in Aspen Meadows, a private enclave of 17 home sites in a premium Cottleville location. This home offers 9' ceilings through out a split bedroom floor plan open concept with 3 bedrooms, 2 baths and a main floor laundry/ mud room along with a 3 car garage. The home opens to a spacious great room with wood burning fireplace, sunlit dining area and kitchen that includes over sized island for additional seating. Upgraded Whirlpool appliances with 42' cabinets and a super sized walk in pantry. The owner suite is the perfect retreat featuring a large walk in closet and private master bath. All Rolwes Company homes include enclosed soffits/fascia, fully sodded yards along with a landscape package. Pictures may vary from actual home constructed. See Steve Lane/new home specialist for all the included features of this home and community.